I was wearing a cream dress printed with violets and sandals. TJ was wearing shorts and a tee shirt. Agent L’s idea of sensible shoes is ballet flats. She also owns no trousers and considers herself equally capable of running in a cute summer frock as in track pants. “I have a cardigan,” I said, mildly. TJ went to dutifully change while I rummaged through the old clothes bag for suitable old tee shirts to use as gas masks. I tucked a shirt in each of our bags, packed mine with the coke and lemons and a small carton of milk. I emerged back on the porch with a pot of vaseline. In a few moments we were all greasy and ready to go. I’m very happy to say we didn’t need any of our provisions after all, but that’s another story. 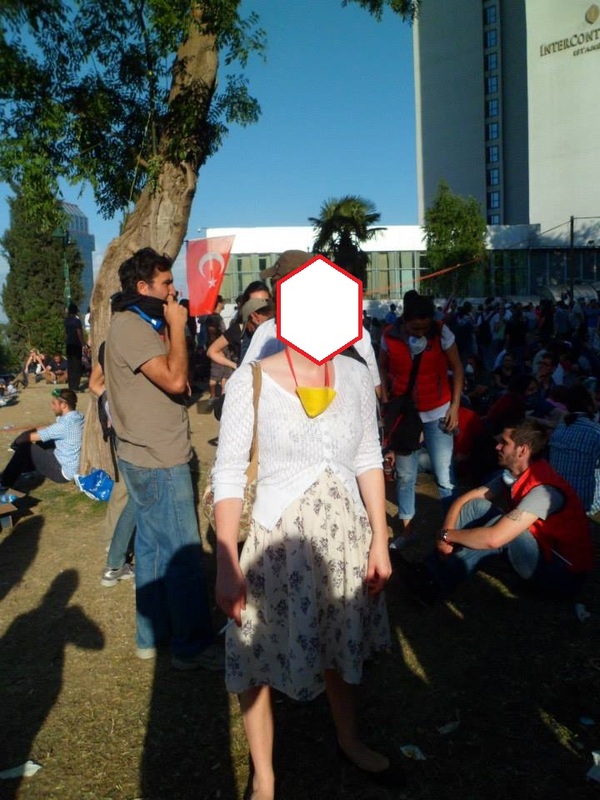 This entry was posted in Gezi Park, Istanbul, Taksim, Turkey, Turkish Politics. Bookmark the permalink. Vaseline makes the gas stick to you and prolongs its effects, don’t use it. I made a T-shirt like a true American.